hands, I sing for joy. Christianity is an “infiltration” to some on the left. In college, they now teach about the evils of “Christian Privilege.” On Broadway and in theaters around the world, mocking Christians has become a massively profitable money-making venture. Rick Shallenberger, our Regional Pastor, recently began a FaceBook posting of “Fake News Theologically”. Here are two, along with a couple excellent comments. May these help you pause and think about our God and His Life & Love for us. 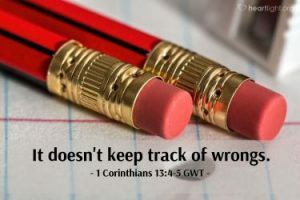 FAKE NEWS – is believing God’s love is based on what you do rather than on who he is. Rick Shallenberger My point is he loves us first as John points out. Many believe God doesn’t love them because they are too soiled, too hopeless, too whatever, and they are afraid to seek God. If we point out that God is Love, as John tells us, people might just change the way they think about him. That’s repentance and leads to living in the truth of Who God is, which leads to loving him. Jeff Chandler (GCI pastor in Arkansas)God is LOVE and He looks like Jesus. We all know Jesus has our back – God the Father is no different. Jesus died for ALL – those that like Him and those that don’t. That’s love. And after all, the Father sent the Son for ALL the world because of His unconditional Love for us. Rick Shallenberger – The truth is that God’s grace is unmerited, undeserved. It is a gift given to us “when we are still dead in our trespasses” and determined to be that gift before the foundation of the earth. (Eph 1 & 2) Forgiveness is the gift Christ gives us. To experience that forgiveness, however, one needs to know the Forgiver! Peggy Perry Due to tiredness after all the chemo and radiation, she has decided to retire. She thanks all for their prayers that guided her.